I’ve been reading a lot recently, but a bit sporadically. There are some library books I want to finish before starting on anything I own. I’m pretty anxious to read more of The Lost Tales of Oz, but I kind of like having something to look forward to. Is that a dilemma for anyone else? Beth says she prefers being in the middle of a good book, and I can understand that, but I find I often have a preference for having done something over being in the process of doing it. It’s not like I’m likely to run out of stuff to read, but maybe of Oz stuff. That said, I did find an Oz book I hadn’t heard of before, which I review later on in this post. 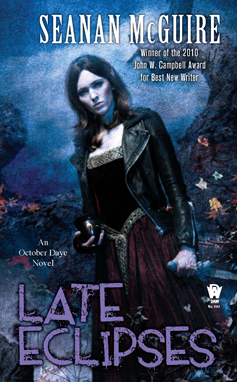 Late Eclipses, by Seanan McGuire – In October Daye’s fourth adventure, she investigates the poisoning of Lily, the Undine of the Japanese Tea Gardens in Golden Gate Park. (A lot of this series takes place in San Francisco, and I can’t say I know a lot about that city.) The Queen of the Mists has Toby herself arrested for the poisoning, along with the killing of Blind Michael in the previous book, which she actually did do. During the course of the story, she learns more about herself and her mother Amandine, who finally puts in an appearance in this one. The Rainbow Daughter in Oz, by Cliff Robertson – I first learned about this book from the Royal Timeline of Oz. The title seems a little weird (I would have used “Rainbow’s” instead of just “Rainbow”), but it’s always nice to find new Oz books consistent with the original series. The characters, including Polychrome and Button-Bright as well as some other familiar faces, all maintain their original personalities; and one of Billina‘s chicks takes a significant role. Robertson even delves a bit into the mythology of Oz, explaining why the weather is usually so mild. It’s attributed to a magic necklace that Button-Bright accidentally finds and takes, causing severe storms to arise in the land. Several characters are called in to rescue the Cuttenclips, whose village is normally protected from such weather by Glinda’s magic, but this has been neutralized. Some original ideas of the author’s are promising, but appear so briefly that they might have been better either expanded upon or left out entirely. Then again, I guess this kind of thing is common in Oz books. 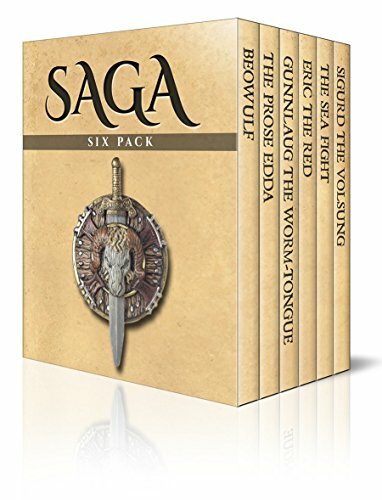 Saga Six-Pack – This was one of several collections of public domain material that was offered for cheap in a Kindle edition, and I thought it had some stuff I should read, which I did in between other things. As such, it took me a long time to finish it. It starts with Beowulf, which I’ve seen summarized many times, but this was the first time I read a complete translation. And, really, I can’t say my understanding of it was increased by the original context, as a lot of it was just people hanging out in halls and arguing. The Prose Edda is a collection of Norse myths compiled by Snorri Sturluson, who including a background for the gods that made them just regular (if heroic) people, and presents some of the stories as an attempt to trick some guy. That’s the problem with retellings of old religious materials by a follower of a different religion, I suppose. The saga of Erik the Red was short, but I found it kind of amusing that it involved Erik discovering Greenland and then basically tricking other people into settling there even though it was a whole lot crappier than Iceland. The Volsung Saga is partially another take on the saga of Sigurd (AKA Siegfried), another version of which was in the Prose Edda, but this one has more information on the hero’s ancestry. The Oathbound Wizard, by Christopher Stasheff – The follow-up to Her Majesty’s Wizard sees Matthew and Princess Alisande still constantly arguing, leading to his swearing to kick the evil King of Ibile (an alternate version of Spain, as Alisande’s Merovence is the equivalent of France) off the throne, temporarily forgetting how seriously oaths are taken in this world. So he ends up having to do it, but he’s fortunately assisted by his old friends, as well as a few new ones including a dracogriff (the offspring of a dragon and a griffin) and a cyclops. He also summons Puck and Robin Hood to help out, the latter said to have lived in many different versions of England. Stasheff ties together a few different versions of the Robin Hood legend by explaining what happened after King Richard came back to England, and how he and the Merry Men were eventually made immortal. It doesn’t really explore the world where it takes place much beyond what the first one had already established, but it’s a pretty good sequel. 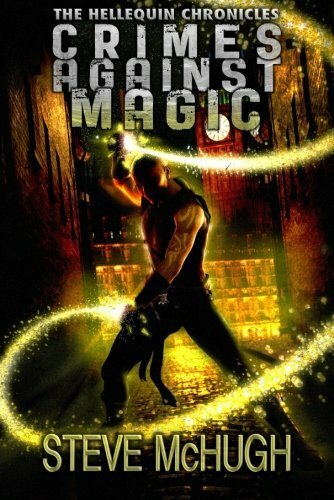 Crimes Against Magic, by Steve McHugh – I’d previously read McHugh’s A Glimmer of Hope, and for some reason didn’t feel like writing a review at the time. I found out it was a spin-off of the Hellequin Chronicles, so I decided to check out the first book in that series. The world featured here is one that mixes mythologies, positing that most of the classical myths were basically true, but not always accurate in the details. It’s also one with magic, monsters, and demons. The protagonist of this book, Nathan Garrett, is a thousand-year-old sorcerer who’s lost most of his memories, and works as a thief and assassin, creating a rather gritty tone. He protects a psychic girl from a plot by Mordred, King Arthur’s illegitimate son and killer, who’s still alive and scheming in the modern day. The Fates and the story of the Trojan War are also significant to the plot, and there are flashbacks to fifteenth-century France. All the jumping around in time is a little confusing, but also what keeps the story interesting. This entry was posted in Arthurian Legend, Authors, Book Reviews, British, Catholicism, Characters, Christianity, Greek Mythology, History, Magic, Magic Items, Monsters, Mythology, Norse, october daye, Oz, Religion, seanan mcguire and tagged a glimmer of hope, a wizard in rhyme, beowulf, billina, button-bright, christopher stasheff, crimes against magic, cuttenclips, erik the red, fairies, hellequin chronicles, king arthur, king richard coeur de leon, late eclipses, mordred, polychrome, prose edda, puck, robin hood, saga six pack, san francisco, siegfried, sigurd, snorri sturluson, steve mchugh, the oathbound wizard, the rainbow daughter in oz, trojan war, undines, vikings, volsung saga, weather. Bookmark the permalink.